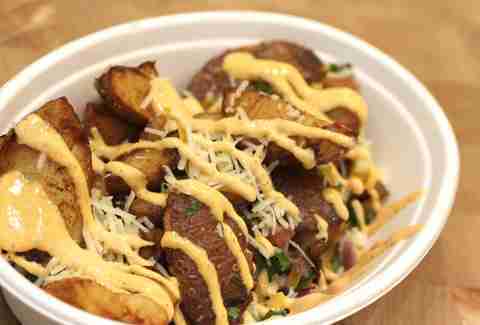 Started by a dude in Jersey who was focused on creating killer sauces, then discovered that potatoes were the perfect delivery vehicle not called "Mom's Saab", Potatopia lets you flow through an assembly counter space featuring all things potato, cheese, and sauce. And, although you can grab a baked potato here, what that ultimately means for you is cheese fries. 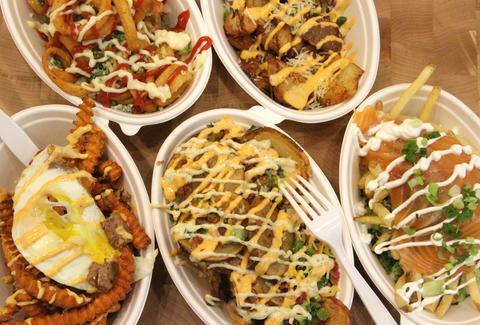 Lots and lots of glorious cheese fries. Everything is 100% customizable. But, presumably in recognition of the fact that you may not have 100% of your brain capacity when you want a shload of cheese fries, they've designed a bunch of posted menu items, including the Smashed Hit, which takes smashed potatoes (just one of their many types of taters), fries 'em, and throws on stuff like cheddar, Asiago, scallions, red onions, and red pepper aioli. 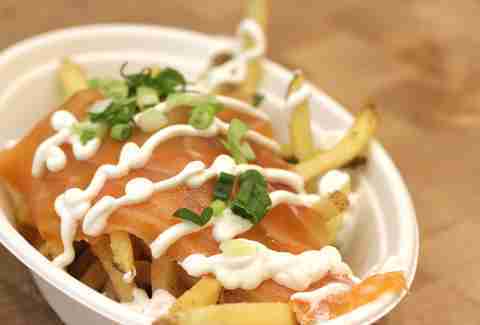 This genius hybrid plate called the Lower Eastsider is basically lox cheese fries. 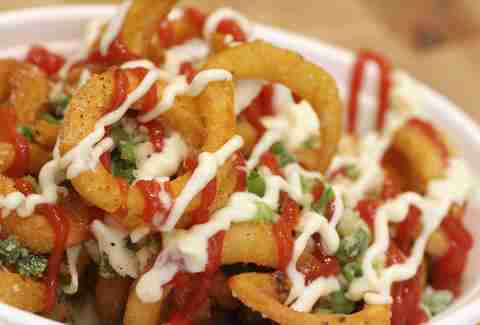 Every bit as delightful and sassy as the Belushi vehicle of the same name, the Curly Sue features curly fries (the only ones to pack a spicy punch), pepper Jack, jalapeno, chipotle ketchup, and garlic aioli. 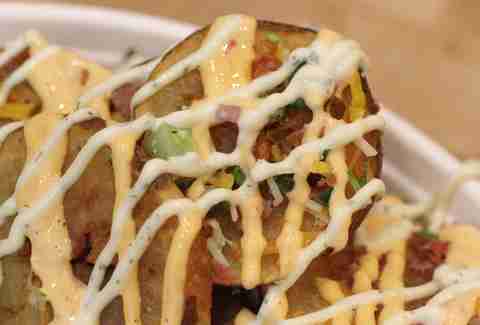 Another favorite is the Comatoser, built on "Skin Chips" -- a mound of potato skins, or maybe really thick and potato-y chips -- topped with cheddar, Asiago, pepper Jack, plus non-cheeses like jalapeno, broccoli, bacon, roasted red pepper aioli, and ranch. Expect it to live up to its name. But, of course, you should create your own, if for no other reason than there's actually a lot more meat available than the menu items reflect. 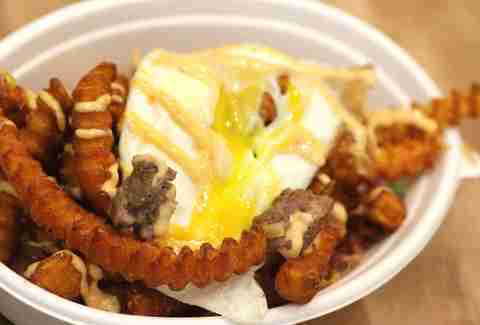 Let us suggest this starter creation: crinkle-cut sweet potato fries, bacon, sausage, savory bacon aioli, cheddar cheese, jalapeno, and a fried egg. And then you get to, like, put stuff on it!